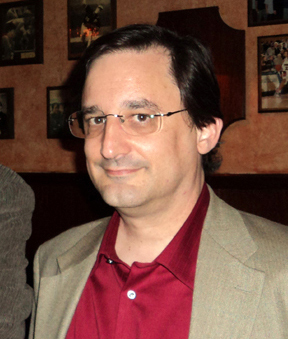 The Author Chronicles warmly welcomes author Michael A. Ventrella. 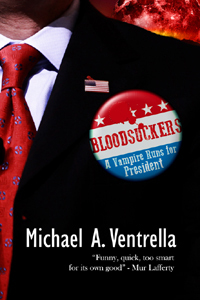 Michael writes high fantasy and pirates, but his most recent book, Bloodsuckers: A Vampire Runs for President, takes him into the contemporary world of politics and vampires. In his interview, he talks about switching genres, blogs, and his dream book. 1. You’ve written mostly high fantasy. And pirates. Why the switch to contemporary paranormal? I didn’t pick a genre. I just had an idea for a story and wrote it. I’ve also published a science fiction mystery story, another about the Marx Brothers in Hell, and one about the Dead Sea Scrolls. I’m not trying to fit myself into any particular niche. Bloodsuckers: A Vampire Runs for President was based on my thoughts about what it would be like to be a politician who could charm anyone to do his bidding. That led to vampires and their mythology. The book is more of a political thriller (with vampires) than a paranormal book (with politics). In Bloodsuckers, reporter Steve Edwards watches in horror as his favorite presidential candidate (who the crazies claim is a vampire, ha ha) is gunned down in front of him. He turns to see the assassin drop the gun, turn into a bat, and fly away – leaving Steve alone and the prime suspect. In order to prove his innocence, he has to prove that vampires exist – not an easy task while on the run from the FBI and the vampires who want their secret kept. 2. Did you find writing Bloodsuckers a different experience than your fantasy? How? Because it takes place in the modern world, I was able to make references to things I could never do in a high fantasy story. There are scenes with current journalists (even a chapter with Stephen Colbert), references to current music and Monty Python and Saturday Night Live. I didn’t have to create the world from scratch. I still had to create the vampire background. In Bloodsuckers we learn that they have been behind the scenes all the time, controlling politicians and major corporations and steering world events to their favor. Using their skill at controlling us, they can get just about whatever they want. But that is too easy. I didn’t want clichéd bad guys who all work together for a common goal. My vampires are just like humans – they don’t all get along, they challenge each other, some are evil and some are good. The great conflict in the book among them is that some want to make themselves known and accepted and some want to remain hidden behind the scenes. 3) Do you do your research before or after your first major draft of the book? Research for this involved reading about vampire lore around the world and working that into the story. In Bloodsuckers much of the vampire lore we all know is fake, and quite a bit made up by the vampires themselves to mislead people. But I also learned what a great tool Google maps are. As my main characters race from Virginia to New York city, I was able to trace their paths and have encounters at places that actually exist, which I think makes everything more real. The final climactic scene takes place in a hotel in Times Square, and I used their web page to describe it and determine where certain things would happen. Then there are political considerations. My undergraduate degree is in Political Science, so I had some knowledge of how the game is played, but I used electoral maps to determine which states had to be won and lost to make the election close. But to answer your question, it took place mostly during the first major draft as I needed it. 4) Are you an outliner or do you like to wing it? I am absolutely an outliner. I need to know how my story ends before I begin, and I need to place all the clues in their proper place to make it work. All my novels have mysteries that the main character needs to figure out, and unless you plan them out, it just won’t be believable. My readers have said to me more than once that they were surprised by the plot twists in my book, and could see afterwards how the seeds were planted. This isn’t to say I tie myself to my outline. The final version of Bloodsuckers is much different from my first idea (although the ending is basically the same). If things go off in another direction, I follow it. Sometimes I realize it’s a wrong turn and go back, but sometimes it really improves the story. 5) You have a well-regarded author interview blog, but you recently started Ventrella Quest: Politics, Society, Religion, and All the Stuff We’re Not Supposed to Debate in Polite Company: Michael A. Ventrella’s Quest for Truth, Justice, and the American Way. Was this a marketing choice to support the political nature of Bloodsuckers, or was it a natural dovetailing of your interests? Mostly, it was to keep the political discussions off of Facebook. It didn’t work. I am a political creature, and I have a viewpoint, and I love to debate. (As a trial lawyer, that’s basically what I do for a living, after all.) I started the blog so that (a) my political thoughts could last longer than Facebook, where a week later it’s gone so far down the feed that no one remembers it; (b) people can post their responses that will last for a while; (c) people who are not my Facebook friends can read the posts and share them; (d) I don’t have to repeat myself and can link back to old posts if the issue comes up again; and (e) it can be easily searched internally as well as show up on search engines. I enjoy the political blog and update it once a day (unless there is an emergency) and also post an editorial cartoon every day as well. I hope everyone will check it out. And if you like my writing, you may enjoy Bloodsuckers. 6) What is the book you dream of writing? Are you ever planning to write it? I have too many. I always wanted to write a Teddy Roosevelt steampunk story. I thought about writing one in the same world as Bloodsuckers where Teddy fights the vampire oil magnates, but it seemed too close to Abraham Lincoln Vampire Hunter. I’m currently taking my pirate stories, rewriting them greatly, and should have a middle-grade pirate adventure ready to send off by the end of the year. Thanks for the invite! 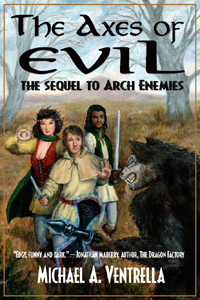 I hope your readers will check out my web page (www.michaelaventrella.com) where they can read the opening chapters of all my books. 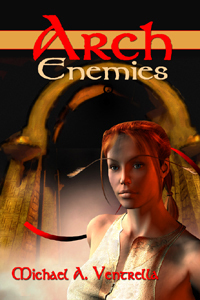 Michael A. Ventrella’s fantasy novels ARCH ENEMIES and THE AXES OF EVIL were released from Double Dragon Press to critical acclaim. 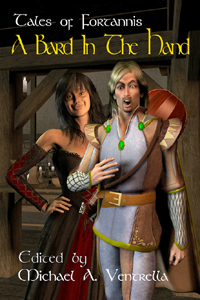 He is editor of the “Tales from Fortannis” anthologies A BARD IN THE HAND and A BARD’S EYE VIEW. His third novel BLOODSUCKERS: A VAMPIRE RUNS FOR PRESIDENT was released in 2014. His pirate short story “X Spots the Mark” appears in the anthology RUM AND RUNESTONES and its sequel “Get Kraken” is in CUTLASS AND MUSKET: TALES OF PIRATICALSKULDUGGERY. His short story “The Jesus Secret” can be found in the collection TWISTED TAILS VII, and “Hell, I Must Be Going” in DREAMERS IN HELL, part of the “Heroes in Hell” series of books. Michael is one of the founders of the biggest fantasy medieval live action role-playing groups in North America and currently runs the Alliance LARP. His Rule Books and Players Guides are available in all formats. He is also the founder of Animato which, in the late ’80s, was the first major magazine dedicated to animated films. He has been quoted as an animation expert in Entertainment Weekly and in various books. At his website’s blog he interviews other authors, editors, agents and publishers to get advice for the starting author. In his spare time, he is a lawyer.